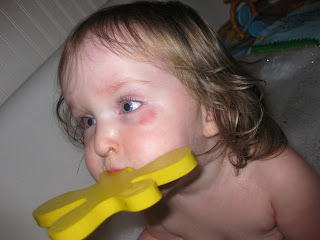 1st Shiner! Poor baby girl! She actually has a little knot on her forehead too but I wasn't able to capture in the photos. She's a tough one! At least she's still smiling...shiner and all! 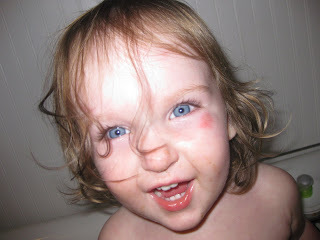 Well, Lola has her first shiner. I'm happy to say this did not happen in my presence, therefore, I didn't have one of those much dreaded "I'm a terrible mother" moments. So, who's presence did it happen in??? Well, none other than Mena (my mom), Memaw (my grandmother) and Aunt Bobbie's (my aunt) presence. Hmmmm!!!! Yes, Lo fell straight off the porch with everyone watching. 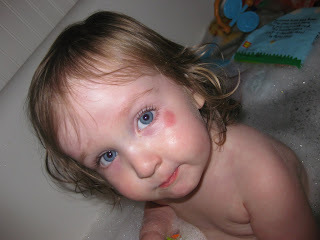 After the fall, when my mom saw Lola's eye, she had deja vu of when I was about 18 months and had my first shiner. Apparently, Memaw was driving me in her car and I was standing up in the front seat when she had to slam on her breaks and I went flying into the dashboard. Boy, how times have changed. Can you imagine having a 18 month old standing in the front seat in today's world??? Anyway, according to their story, there was really nothing they could have done to prevent Lo's fall/injury. 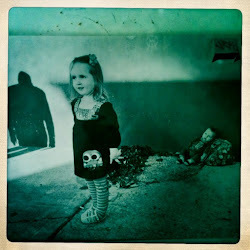 It's all just part of being a toddler and I'm surprised it didn't happen before now!!! Clay and I can even harmonize on this one. We've actually developed some stellar harmony on the Alphabet song too. We're elated that Lo can sing along with us now!